Decorating your aquarium fish tank can be fun and an exciting. It’s a lot of hobbyist’s favorite part of owning an aquarium. 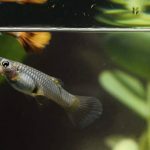 After setting up your Guppy and/or Livebearer’s aquarium tank with the essential equipment. Next thing you should consider adding in is decoration pieces to decorate it. 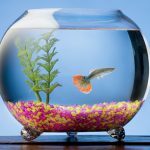 Besides making it look nicer, decorating your aquarium tank can also be beneficial to help your fish feel comfortable and help reduce their stress. By lowering their stress, it also helps prevent any diseases. 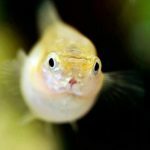 Decorations in your aquarium is a very important aspect to how it looks. A bare tank can be really boring to look at although it’s really easy to clean. It’s important that you thoroughly clean any decorations before adding it to your aquarium. 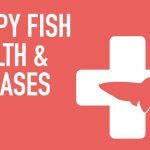 Also choose your decorations carefully and not add in any decorations with sharp edges that could potentially injure your fish. When choosing decorations, try picking ones that aren’t solid objects so it will help provide good cover. For example, a piece of brick would be a poor choice since it’s heavy and takes up a lot of space while providing almost no area for your fishes to hide. A much better choice would be a terra cotta clay pot with a piece broken to create a cave spot for your fish to hide in it. 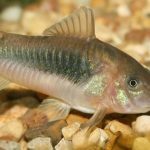 Decorations that you can use for a freshwater aquarium is different than a saltwater aquarium. Remember when adding decorations to your aquarium, you’ll also have to clean it as part of your regular maintenance. So try not to overload your aquarium with decorations otherwise it will make it a real chore to clean! An old toothbrush or any hard bristled brush works great for scrubbing your decorations. Gravels and substrates should be cleaned with an aquarium siphon vacuum gravel cleaner. 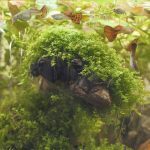 Plants can help add a whole new dimension to your aquarium tank. Live Plants requires a bit more work than artificial plants does when it comes to maintenance. Cons: Requires more work. Requires fertilizers, carbon dioxide and strong fluorescent lighting. Pros: Last longer and won’t rot. Can look just as good while costing a lot less. 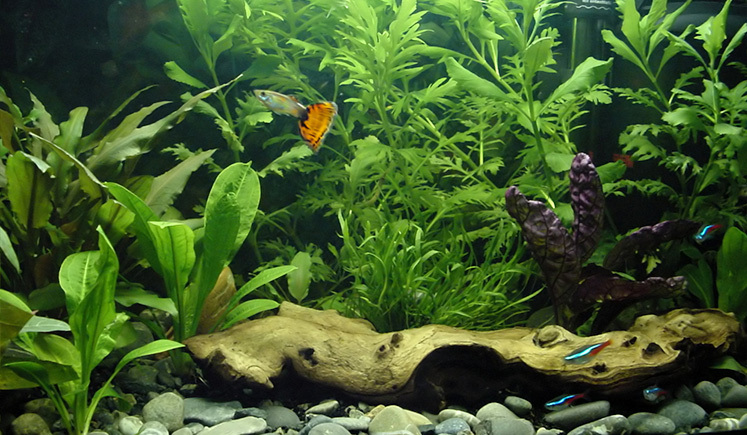 Adding substrate to your aquarium tank can instantly make it look more filled up since it removes the bare tank look. If you plan on adding Live Plants then it’s an absolute must have since it . Make sure the background image you choose is laminated otherwise it will wrinkle over time since you’ll get it wet no mater what. Note: Only add wood you bought from the pet store or to your aquarium.